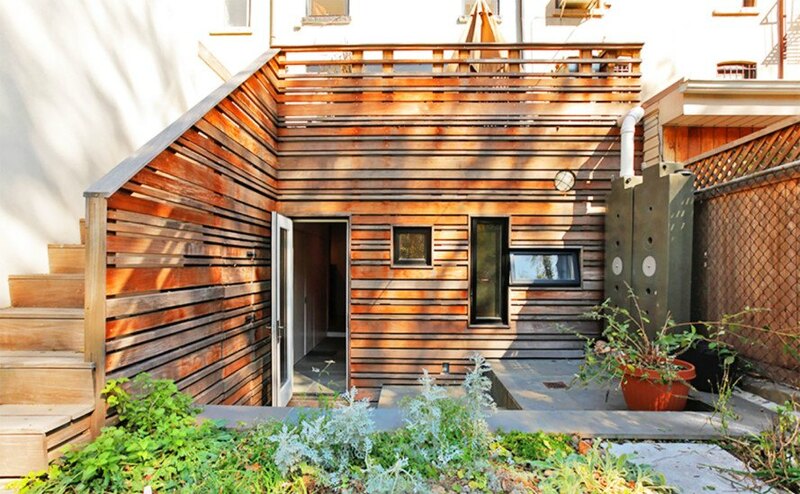 Eco-architecture firm Thread Collective seems to be transforming Brooklyn into a hotbed of sustainable design one home renovation at a time. The architects' work on this Park Slope row house was a study in sensitivity as it was important to retain some of the building's historic detailing. Read on for photos of the finished product, which marries the home's charming features with numerous modern eco-friendly touches. Although the architects wanted to retain the character of the historic Park Slope row house during the renovation, the plan called for installing quite a few modern features that added not only livability to the home, but also to its energy efficiency. The interior’s exposed brick walls and concrete flooring pay homage to the original charm of the space, but sustainable add-ons such as solar panels bring the home into the age of energy conservation. The new design concentrated on strategically adding more open space to 2,500-square-foot home. A large folding exterior glass wall was installed to seamlessly connect the exterior with the interior, effectively bringing more natural sunlight inside. One of our favorite interior design features in the home is a strikingly beautiful 3Form plexiglass and steel staircase that leads to the upper floor. Although creating space within set boundaries is often challenging, the design team was able to build a new rear addition clad in salvaged wood slats to make room for a new master bedroom on the ground floor. Although the architects wanted to retain the character of the historic Parkslope row house during the renovation, the plan called for installing quite a few modern features to the home. Among the gorgeous interior design features found throughout the home, a strikingly beautiful 3Form plexiglass and steel staircase leads to the upper floor. Exposed brick and concrete slabs pay homage to the original character of the space. Sustainable features such as solar panels bring the home into the age of energy conservation. A large folding exterior glass wall was installed to seamlessly connect the exterior with the interior, effectively bringing more natural sunlight to the interior. The new design concentrated on strategically adding more open space to 2,500 square foot home. The new modern features added not only livability to the home, but also modern energy efficiency. The modern interior design brings new life into the historic home. The kitchen serves as the heart of the design. The interior design skips the minimalist trend for a more welcoming feel. Although creating space within set boundaries is often challenging, the design team was able to build a new rear addition clad in salvaged wood slats to make room for a master bedroom on the ground floor.